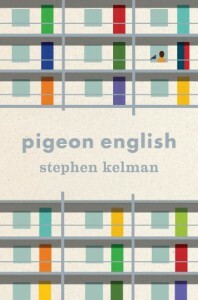 Pigeon English - Stephen Kelman - review - So Many Books...So Little Time! I should probably write a long detailed review of this book; it really deserves it. But I am not the most articulate person and I don't feel I could give it it's due praise in words that would convey how I felt about it. I should have known that reading a book in a language other than my own would be difficult; I speak American Southern English and this is written in London slang English. Yes, I got most of it but much of it was truly a foreign language. I still don't know what "hutious" means and if I never hear "innit" in real life, that will be okay with me. Here's the thing about this book; after a while I didn't care about the language, the story had me completely wrapped up. Harri was such a little charmer, so innocent and unaware of the very violent surroundings he and his family were living in. The little stories he would tell about his Dad, Grandma and little sister back in Ghana were so sweet. Told against the real life stuff he and his older sister were dealing with living in the projects of London, these experiences were as different as night and day. I really hated the end. That's why I can't give it five stars. It really pissed me off but I think that was the author's intention. The story ends abruptly and in a way that completely surprised me. So much so that I reread the last chapter a few times to make sure I had gotten it right. I had, and it sucked.